Professional yearbooks made simple! Designed with you in mind. In addition, you’ll get a personal account manager by your side through the yearbook journey to make your perfect yearbook. Manage your school yearbook payments easily. Set up an online parent payment system to stay organised. Simply choose a yearbook theme, upload your images and add your text to pages. In conclusion, it’s really that simple! Yearbooks - Capturing the memories that matter! You’ve helped shape them into the people they will become and now it’s time to remind them where their stories started with school yearbooks. Keep the special memories alive with school yearbooks filled with their best friends and favourite moments from their time with you. Make your yearbooks anytime, anywhere with our responsive Online Creator. Whether you have 10 minutes or an hour, hop on and start creating your yearbook of memories for free. From as little as £7.99 per book and with many themes to choose from, why not give our Free Online Creator a go today? 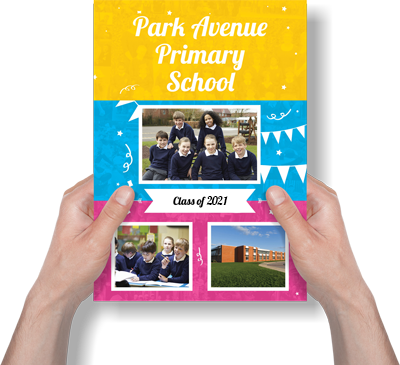 Similarly, our sample book shows you our most popular school yearbook design and demonstrates the quality print we produce for all schools across the UK. Pick a binding type to suit you and make your yearbook the best it can be! Pages are stapled together inside a 250 gsm gloss cover. This requires your page count to be a multiple of 4 for easy binding. Hardback books are considered the premium option so have a slightly different price structure to paperback yearbooks. The valuable inside pages are glued together inside a 250 gsm gloss cover to give your yearbook that shiny look and exciting feel.